Arrive in Cairns & collect your Britz. For a relaxing start to your holiday why not enjoy a cruise to the outer Greater Barrier Reef with Sunlover Cruises (20% discount). Experience the majestic views that mother nature has to offer with use of snorkelling equipment and glass bottom boat, also includes morning tea, buffet lunch and reef presentation. Enjoy a scenic drive up to the mountain village of Kuranda while taking in the breath taking views of the rainforest gorges. Why not have lunch at the Tjapukai Aboriginal Cultural Park and take in the sites (10% discount). A great tour to consider is the Mareeba Wetlands en-route to Port Douglas, a destination of unsurpassed beauty situated on one of Australia's most beautiful stretches of coastline. Experience the sites from amazing views with Ballooning with Hot Air (10% discount). Enjoy a full day cruise to the Great Barrier Reef, where snorkelling and a mini submarine ride provides a spectacular view of this natural marvel. Drive to the Daintree World Heritage Listed Rainforest area (approx 50 kms). Enroute take a cruise on the Daintree River Train (10% discount) or stop to explore the many walking tracks in the area. Day at leisure to exploring the Daintree region. Wildlife tours, rainforests & cruises. Arrive in Cairns & collect your Britz. Drive to Innisfail (approx 90 kms) a colourful town on the banks of the North and South Johnston rivers. For a taste of croc-hunter fever visit the Johnstone Crocodile farm for a lively feeding show. If you enjoy lush green settings visit Paronella Park for a stroll through 5.2 hectares of pleasure gardens & the nature complex, receive 10% off admission price. 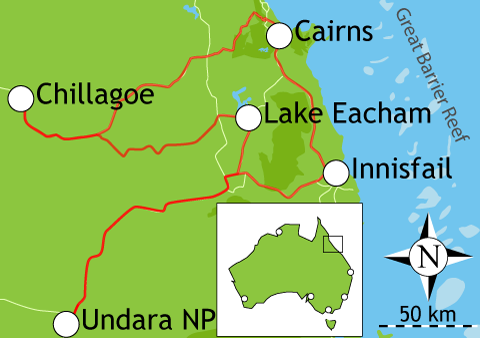 Drive to Undara National Park (approx 160 kms). Undara's most famous landmark are it's unique volcanic lava tubes. View the sunset over the rugged Newcastle Ranges and enjoy a complimentary bottle of wine when you dine at Undara Experience restaurant. Enjoy the day at your leisure, there's heaps to see! Take a day tour and discover the environmental, geological & historical features of the Undara area. Today head north through the lush region of the Atherton Tablelands. This route makes a interesting alternative to the coastal route as jungle-fringed volcanic crater lakes, spectacular waterfalls and fertile farmlands unfold to make this area one of the most picturesque touring areas in the Far North. Explore the region by heading further north to the Chillagoe caves region (approx 100 km each way) or take a more leisurely pace and enjoy a boat cruise on Lake Barrine. Experience the magical sites of Dunk Island by enjoying a relaxing & leisurely day cruise. Drive down to Clump Point Jetty and take a full day cruise over to the Island, where tropical rainforest meets the palm fringed beach of the Coral sea. Enjoy the tranquil scenery at your leisure and return to the mainland in the afternoon. 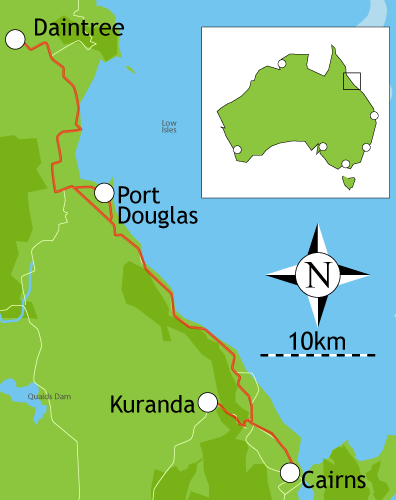 Continue south along the Bruce Highway through sugar cane country past the towns of Tully, Cardwell and Ingham to Townsville, Australia's largest tropical city, the administrative and commercial capital of Northern Queensland. For an interactive wildlife experience visit the Billabong Sanctuary. Feed the crocodiles, holds the koalas and feed the kangaroos (10% discount). You may wish to visit one of the many beaches, waterfalls and outstanding national parks enroute. A pleasant 20 minute catamaran ride across Cleveland Bay takes you to Magnetic Island. 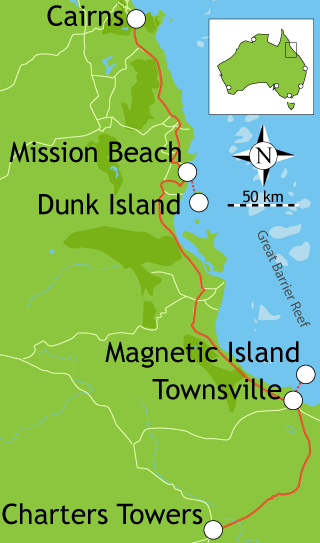 The island is a seaside suburb of Townsville, with some 1500 permanent residents. Over half of this mountainous island is a national park and bird sanctuary, with good walking tracks. Or you may prefer to hire a moke or bicycle to explore it's beaches and take advantage of the variety of watersports and activities on the island. Charters Towers is known mostly for its heritage and goldmining history, this city once had a population of 27 000 and had the only Stock Exchange in the world to take 3 calls a day. Visit the restored Old Stock Exchange or the Military Museum for a historic trip back in time.